More than twenty states have enacted medical marijuana laws since proposition 215 was passed by California voters in 1996. The earliest medical marijuana laws typically only provided criminal protections, however in the past two decades, laws are now extending protections to housing, schooling, domestic relations, and employment. State marijuana regulations uniquely address aspects such as possession limits, methods of ingestion, distribution, dispensaries, qualifying conditions, and actions employers can take in the wake of positive drug test results. Generally speaking, employees have some protections and legal rights in the workplace against various forms of discrimination and unfair practices. Under the current landscape of today’s medical marijuana laws, in some states, employees can now hold marijuana registry cards and use the substance if they suffer from certain specified qualifying conditions such as post-traumatic stress disorder (PTSD) or chronic pain. These laws are inconsistent and constantly changing, including the degree of protections offered in the workplace—and an employer may have a duty to accommodate off-duty use. It is important for employers to understand how employee protections regarding marijuana can vary from state to state and whether or not they have a duty to accommodate. In the following seven states, either the medical marijuana statute explicitly provides no protections, or the statute is silent and the state has case law that has found no employee protection for off-duty use under each state’s respective medical marijuana act. An example is Ohio’s medical marijuana law, enacted in 2016, which explicitly provides that employers have the right to establish and enforce zero-tolerance drug testing policies. Seven states and the District of Columbia have state medical marijuana laws that are silent as to employee protections and generally only provide criminal protections. Some of these states have issued agency guidance or other relevant case law on the topic. 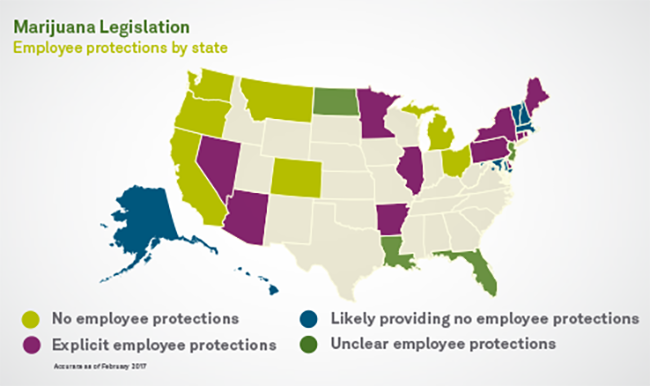 The following eleven states have statutes with explicit language (anti-discrimination or reasonable accommodation provisions) providing varying levels of employment protection. These laws generally prohibit adverse action against an employee/applicant based on their status as a medical marijuana cardholder or participation in a marijuana program. Most of these laws are very new and need additional guidance; none have been tested in court. Some states, such as Arizona, Delaware, and Minnesota, explicitly address drug testing and provide that a positive drug test alone cannot automatically be grounds for refusal to hire, firing, or other adverse employment action. Four states have medical marijuana laws that are silent or vague as to employee protections, and the applicable state regulatory agencies have not provided guidance on employee protections. Two of these states, Florida and North Dakota, were just passed in November 2016 and are grappling to provide guidance. Current trends indicate that states are allowing more employee protections in state marijuana laws. However, under current laws, employers in all 50 states do not have to accommodate an employee working “under the influence” of marijuana or the use of marijuana by an employee while on-duty. More importantly, in current marijuana laws, there are no restrictions that limit an employer’s ability to drug test for marijuana. Employers motivated to maintain a drug-free workforce should have a clearly written policy that complies with all applicable state, federal, and local laws and that summarizes expectations and consequences as appropriate.